The Insatiable Critic: Introducing the new Critic Kitteh: Batman! Introducing the new Critic Kitteh: Batman! Batman is judging you - right now. He's brooding, sneaky, has lots of opinions, and most importantly - loves watching movies. Introducing the new Critic Kitteh - Batman! 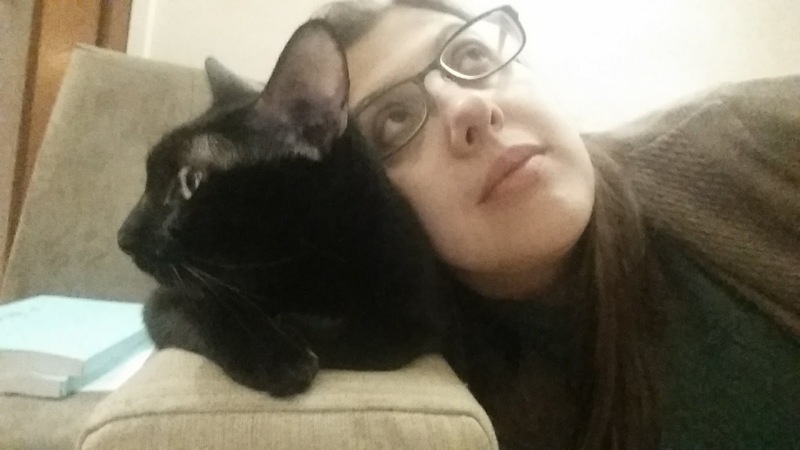 After almost two years of being feline deprived after our dearly departed Sir Toby passed away, my husband Casey and I decided to do something about it. Now safely ensconced in a pleasant, pet-friendly apartment, we went in search of adopting a rescue kitty. I have found in my life that you don't pick the cat; the cat picks you. The story of Batman's adoption is no different. The process of acquiring a cat in Hong Kong is harder than one would initially think. The first adoption centre all but slammed the door in our faces when we showed up to look at cats during business hours without an appointment, and promptly told us we would not be let in unless we registered on their website. Thinking it would be better to try another avenue, we found out there was actually a shortage of adoptable cats at the local SPCA! A coworker then suggested we look into a local shelter called Hong Kong Cats where (like everything else in this city) you would still have to fill out a form on the website, but they were less strict about letting potential adopters meet the cats. We submitted the form and waited. Sure enough, within a couple of days the director contacted us via email and said that there was a cat that needed a foster home urgently and would we consider being foster parents with the potential to adopt? She referred me to their Facebook page where his photo was posted and we saw a sleek, diminutive-looking pocket panther with jade green eyes. While we had both hoped to have the opportunity to visit with a few kitties and see which one we clicked with, after some discussion we decided it wouldn't hurt to help the little feller out. If it didn't work out, we could always give him back to the shelter, and in the meantime buy some time for them to make other arrangements for him if need be. So I emailed back the director and said sure, we would be willing to foster him, could we come by over the weekend to meet him and arrange transportation? The response back was almost immediate - great, but he needs a home by TONIGHT. Be careful what you wish for! After scrambling around for needful items (such as a litter box) and finding to our great relief there is an excellent pet store right across the street from us, a much larger than anticipated 12-pound Batman (not his original name), crash-landed into our lives. The first four or five days were dubious - he mostly hid in the corner and barely ate. Casey thought he had magically escaped the apartment the second day we had him because he couldn't find him anywhere (and trust me Hong Kong apartments aren't that big); it turned out he had just camouflaged himself behind our equally black TV. 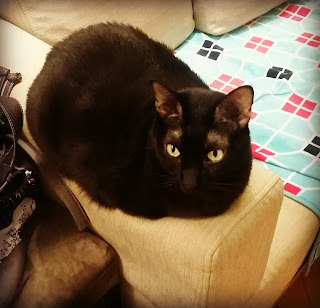 We kicked around various names for him - Houdini (inspired by my dear friend and audio queen Tavia Gilbert's black kitty), Ninja, Mister Mistoffelees...but nothing seemed to quite fit. Along about the sixth day, something miraculous happened - he had been hiding under the bed as per usual most of the day when we decided to sit down and watch some Batman the Animated Series. The minute the famed Batman theme by Danny Elfman came on, he came rushing out like a black streak and joined us on a chair, from a safe distance, to watch with us. Casey and I looked at each other and we knew. Of course, we also realize that makes us his joint team of Alfreds, but we figured that just came with the territory. As the days went by, Bats decided he liked our modest high-rise home on the 29th floor, and we formally adopted him as of Sunday, February 4 - just a few short days before the second anniversary of Toby's passing on February 12. Now he joins us on the couch for film watching; usually on one or both of our laps, has become my new alarm clock, and fills that spot in my heart that was once again ready for a purring bundle of awesomeness. Other favorite pastimes include sneaking up on us, wild rumpuses at around 10pm (catnip gratefully appreciated), sleeping under the covers, looking down upon the city of Kong Hong through our (closed!) windows with a watchful eye, sharing his opinions with a wide variety of mews and purrs, and sitting in front of the laptop to make sure I'm writing only good things about him. Many thanks to Jackaroo, my dear friend Debbie Blinder's Russian Blue who has served well as interim Critic Kitteh; a colorful character in his own right. And of course to our dear Toby, though gone from this plane of existence lives on in the hearts and memories of his many friends, fans, and admirers. Batman has some big paws to fill, but we are confident that he will enjoy being a part of our lives and this blog for many years to come.